The Gaelstone Media Group is a name that you’re going to become quite familiar with in the near future. Not only has GMG been tapped by our friends at Zica Toys to bring us a 6 issue story arc of Sectraurs named Legacy of the Sectaurs. That’s not all GMG has up their sleeve! There’s another project coming our way that is sure to please us Modern Army Action Figure fans. That project? 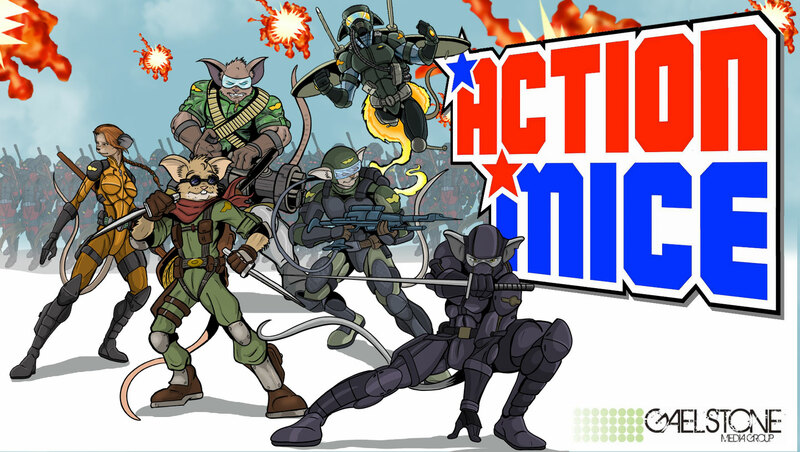 ACTION MICE! Whiskers – Whiskers is a by the book kind of Soldier. Chunk – Chunk is as tough as they come. Pika – Pika is a master at getting into those secret dark places. Pulse – Pulse has a high understanding of all things refracted & projected. Silhouette – Silhouette is an enigma. Baron Ironweasel – Like all megalomaniacs, his views of the world are twisted. Kyoto – Kyoto is a lethal combatant in all forms of fighting styles. Ironweasel Elite – the Iron Weasel Elite are the best of the best. Ironweasel Shock Troops – The Iron Weasel Shocktroops are the grunt forces of Baron Ironweasel’s Iron Armies. There’s even MORE awesome coming our way via this new venture, but that’ll be kept in the BARN for now. We’ve collected a sample of images and bios for you to check out after the break.